RESKIN Solution BB Sun | beauty. bikes. When it comes to BB creams, you can be sure that the Koreans know what they’re doing, considering how they were the ones that first started the BB cream craze that has taken the beauty world by storm. Even western brands from drugstore (Maybelline) to high-end (Dior) have jumped on the BB bandwagon, rolling out BB creams promising all sorts of good things for your skin, such as moisturizing and anti-aging properties. But really, what is BB cream and why is everyone so crazy about it? First formulated in Germany by a dermatologist looking for a product to protect her patients’ skin after surgery, BB stands for beauty balm/blemish balm and is a all-in-one facial cosmetic product to replace serum, moisturizer, primer, foundation and sunblock. Sounds like a dream come true for all the busy ladies out there, your morning skincare AND makeup routine settled all in one step. Known as the “secret of korean actresses”, who are famous for their porcelain smooth and radiant-looking skin, it is no wonder why everyone wants to get their hands on this. In fact, BB creams became so popular that cosmetic companies have refined the formula and came up with, I kid you not, CC (Color Correcting) creams. But that’s a review for another day. 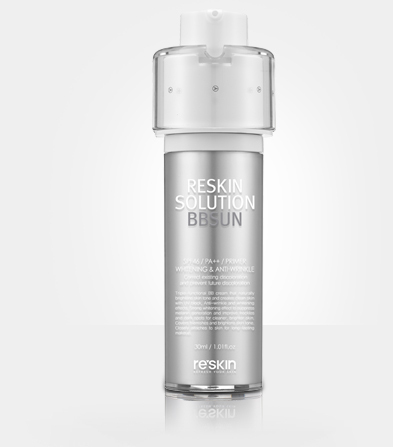 Korean skincare and cosmetic brand, RESKIN, has also come up with their own line of BB products. Specializing in organic skincare products that maximize the skin’s self-renewal capability, the major ingredients in RESKIN products include herb extracts with a natural aroma extracted from 100% of natural essential oil. Part of their RESKIN Solution BB & Sun line, the BB Sun is said to be made up low-irritant ingredients, making suitable for all skin types. SPF 46 / PA++ provides protection from UV rays while concealing blemishes and hyper-pigmentation, giving a natural and clean finish. Formulated with active ingredients and essential essences, it promises to correct existing discoloration and prevent future discoloration and wrinkles. More importantly, it is embedded with a primer to ensure that your makeup doesn’t slip and slide around your face during the day. Its fancy futuristic packaging does more than look pretty on your vanity, protecting the active ingredients in the cream from exposure to light and air, while the pump makes for more hygienic usage. Application tips: This should be the last step in your skincare routine, or the first and only step if you’re in a rush that morning. Pump an adequate amount of product onto your fingertips and gently spread it evenly over your face, patting it to aid absorption into the skin. Just a heads up, this BB cream contains quite a bit of silicone, probably to ensure that the product has a smooth and matte primer-type finish. If you’re sensitive to silicone, do take note of that. Also, titanium dioxide and zinc oxide are also present in relatively high levels in the cream. The good thing is that these ingredients are usually used in sunblock so your skin is definitely safe from the sun, but the tradeoff is that they leave an “ashy/grey” cast and a sticky and heavy feeling on the skin. While it sounds like a very promising product, we’ll have to wait a while to see whether it does live up to its claims. But first, we’ll be reviewing this BB cream and comparing it with a CC cream in an upcoming blog post so keep your eyes peeled for that to see which one your money is better spent on! RESKIN Solution BB Sun (30ml) retails at SGD$69 and is available at Sephora Singapore. Tags: bb cream, cosmetics, korean, makeup, reskin. Bookmark the permalink. 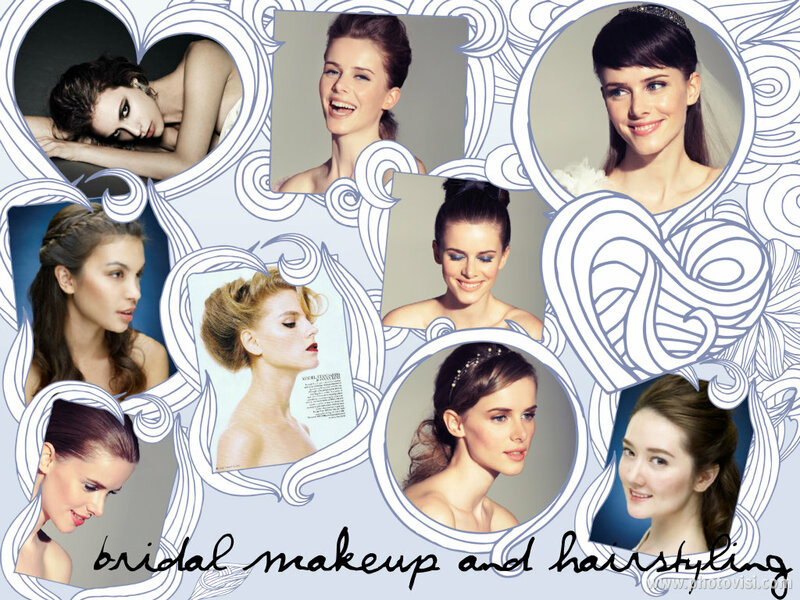 Previous post ← Everything you wanted to know about Bridal Hair & Makeup: Your Top Questions Answered!